Starting in La Habana the old Spanish capital that has seen better days but has a romance of its own despite the revolution! The tour takes you next to the colonial town of Trinidad and a trip into its sugar plantation past. A relaxing day on an island beach follows, where you can sip a rum Collins or enjoy the under sea world while getting your sun tan established! 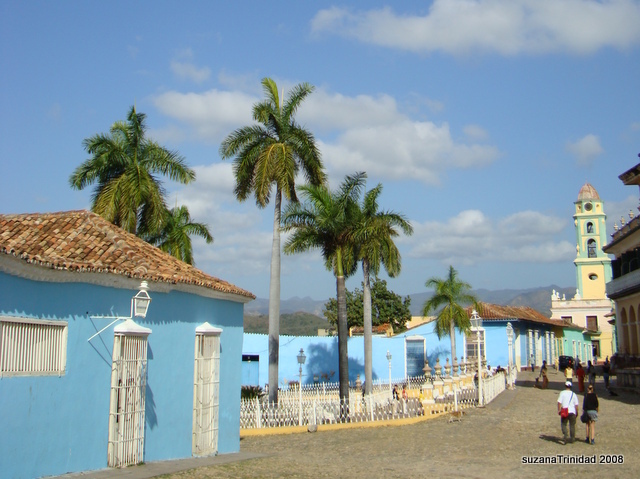 We move on to the traditional countryside town of Vinales in Pinar del Rio where the campasinos offer you a taste of tobacco and rum and a night of great dance music. Follow that with a day relaxing on an uninhabited island surrounded by seas of turquoise and blue. This could be paradise! All good things come to an end and we must head back to Havana and say our goodbyes .Why not have one last Mojito in the old city before jumping into a taxi to the airport? 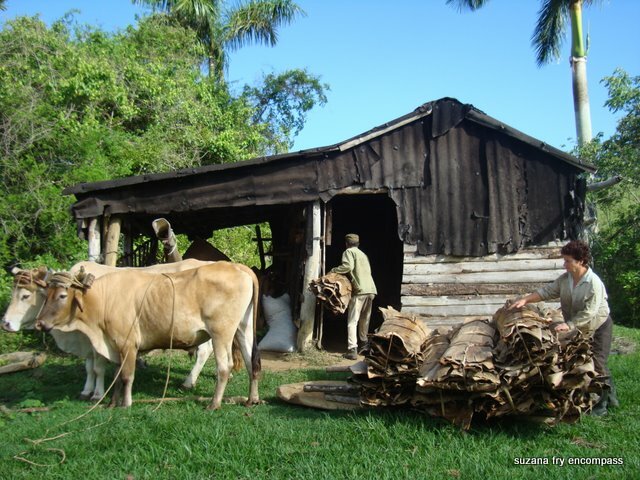 If you have limited holiday time but you want to learn more about this extraordinary island and meet some local people this is the Cuban experience for you. Warning! 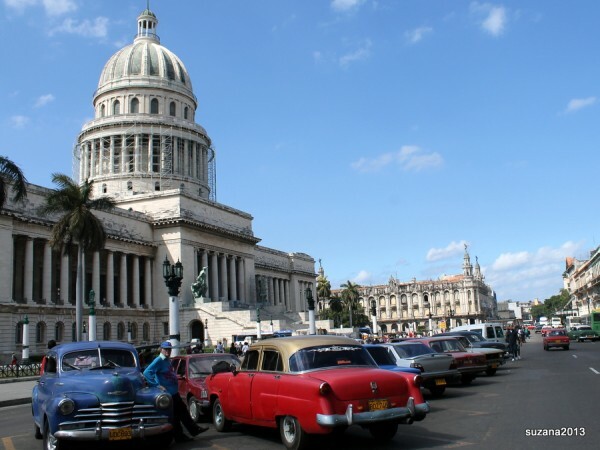 Once you have been to Cuba you will want to return! Cuba’s national tree, the Royal Palm, dots the landscape as you fly into Jose Marti International Airport on the outskirts of Havana City. Welcome to Cuba and your encompass holiday. Your tour leader or tour representative will be waiting ***to take you from here by taxi to your accommodation in La Habana Vieja (Old Havana, which is a UNESCO World Heritage site) Once all your questions have been answered there will be time to enjoy a Cuba Libre in one of the many bars surrounding Plaza de Armas. Music seeps out onto the streets and the romance of the old city will charm and captivate you. Your holiday has begun! After breakfasting in your casa the day will be spent exploring this diverse city. Havana Cuba! the name alone conjures up a montage of images from pre Revolutionary days of Hemmingway to ” Viva Fidel” and “Long live Cuba Libre”, Rum, Cigars, Sugar, Coffee, Rumba, Salsa, old American cars and a memorable mixture of colourful characters. Activities today including Hop on Hop off Bus Tour, entry to Museum of the Revolution or Museo de Bella Artes (Modern Art Gallery) and Tour of Partagas Cigar Factory. Today its an early start to catch our bus to Trinidad on the south Caribbean coast, but the countryside seen from the bus is reward in itself. We’ll arrive in Trinidad with time to explore on foot before dinner and you might even have time to take a ride on a horse or arrange a dance class. Trinidad is another UNESCO world heritage site and the town is preserved in its colonial style with cobbled streets and tiled roofs. It’s an enchanting location in a sugar growing area of the island with views out to sea. 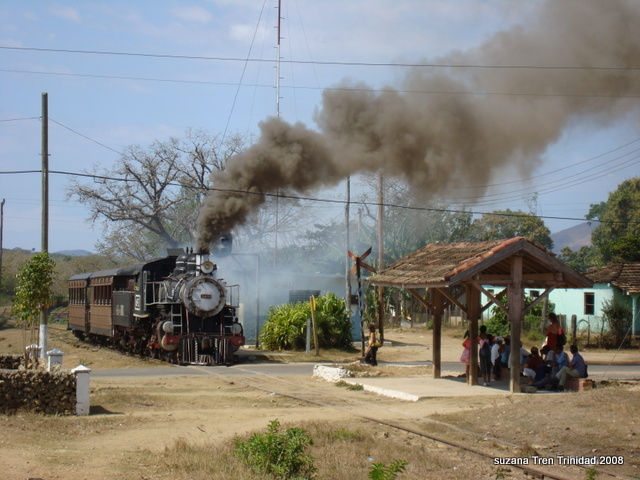 Our days here will include a Tour to an old sugar plantation “Valle de los Ingenios” in a steam train. The pace is slow. You can climb the famous bell tower at “Manaca Iznaga” plantation or try a glass of sugarcane juice and imagine the life in the Spanish colonial days! You’ll have a day tour to one of the Cayos, (Cayo Blanco or Cayo Iguana depending on availability) and lunch is included in this tour. Snorkelling, swimming, sunbathing, perhaps a fruit cocktail or something stronger. Your nights can be spent enjoying a variety of music, at the casa de Trova where ballads are played at the casa de musica on the steps of the church while sipping a long cool drink beneath the stars. There is a cultural show on offer most nights for a couple of pesos and well worth seeing the traditional dancing and drumming and if it’s a disco you want there is famous one in a cave just out of the centre above the main plaza!! Trinidad is an expanding and developing city due to tourism and restaurants are becoming abundant, you are spoilt for choice and don’t forget your casas will be keen for you to taste some home cooking specialities. This morning we will need to be up early and catch our bus heading east to the rural town of Vinales. Set among the tobacco plantations this area is a UNESCO world heritage “cultural landscape” and grows some of the best tobacco in the world. You will learn more about the agriculture during our afternoon’s Countryside walking tour. 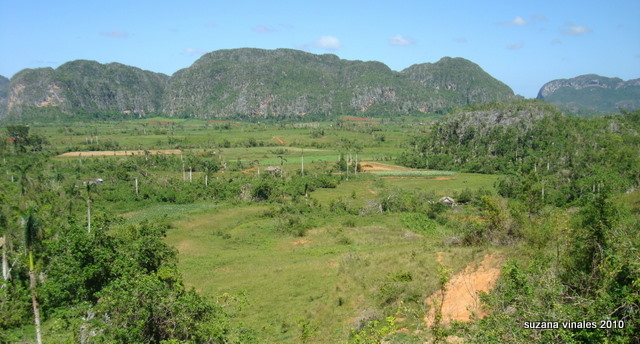 The landscape is unique in Cuba for its limestone haystack hills “magotes”. You can rent bicycles to explore on your own or visit the small but beautifully kept botanical garden. We’ll have a day tour to Cayo Jutias with lunch included. Music and dancing is available every night in the Casa de la Musica “Polo Montanez” for a few pesos. Musicians often set up in the plaza in front of the church or in small bars playing ballads and other local favourites. Vinales has a growing selection of restaurants including a Vegetarian restaurant that also supplies meat dishes!You can organise dinner at your casa particular where your host will dish up her best or favourite dish or something typically Cubano. This morning we must return to the hustle and bustle of Havana having enjoyed and tasted a little of everything Cuba has to offer. After our bus ride, we must say good bye! The week has flown by! For more information we invite you to go directly to the Contact Us page, we will be more than happy to answer any questions or queries you may have. This entry was posted in Tours and tagged art gallery, beaches, cayo lavisa, central america, Cuba, Havana, holiday, hop on hop off bus tour, museum of revolution, small group tour, sugar, tabbacco, Trinidad, Vinales by webmaster. Bookmark the permalink.